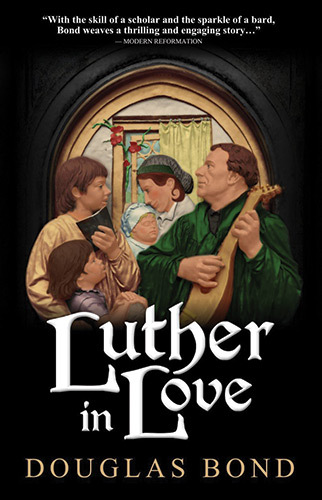 Luther in Love shows us the Reformer from the perspective of his better half. The story begins with 62-year-old Luther spending an evening in his chair. He's not in the best of health – worn out from a lifetime of controversy and conflict – and his dear wife knows that it can't be long before he is gone. So she has given herself a bittersweet project to complete. Others have written accounts of the Reformer, but always from one extreme or the other - either thinking him "the spawn of Satan" or "a living angel." She wants the world to know the real man, and she's going to record his story as he remembers it. But Katie doesn't want her husband to know what she's up to, so even as she's prodding him about the past, and has paper and quill at the ready, he thinks she's busy keeping track of the family finances and other business matters. It's a great premise and let's Bond explore Luther's life through the appreciative, but far from naive perspective of his helpmeet. After all, who knows a man better than his wife? One strength of the book is the thorough research evident throughout - we are immersed in Luther's world! And then there is Bond's writing – this is the fourth fictionalized biography Bond has written about Reformers, and he is a master of this form. Again and again I had to get up to find my wife and read sections to her that were simply too exciting, or too sweet, not to share. Some of that sweetness comes up when the two are teasing and debating each other. Bond gives us a wonderful look at how two souls can grow old together and continue growing in love for one another. It's a book about Luther, but it's also a model for marriage. Of the many books I've read about Luther, this is one of the biggest. But it might just be the fastest read. That's why I'd recommend it to anyone and everyone, teens and up. It is funny, entertaining, informative, sweet, challenging, and more.